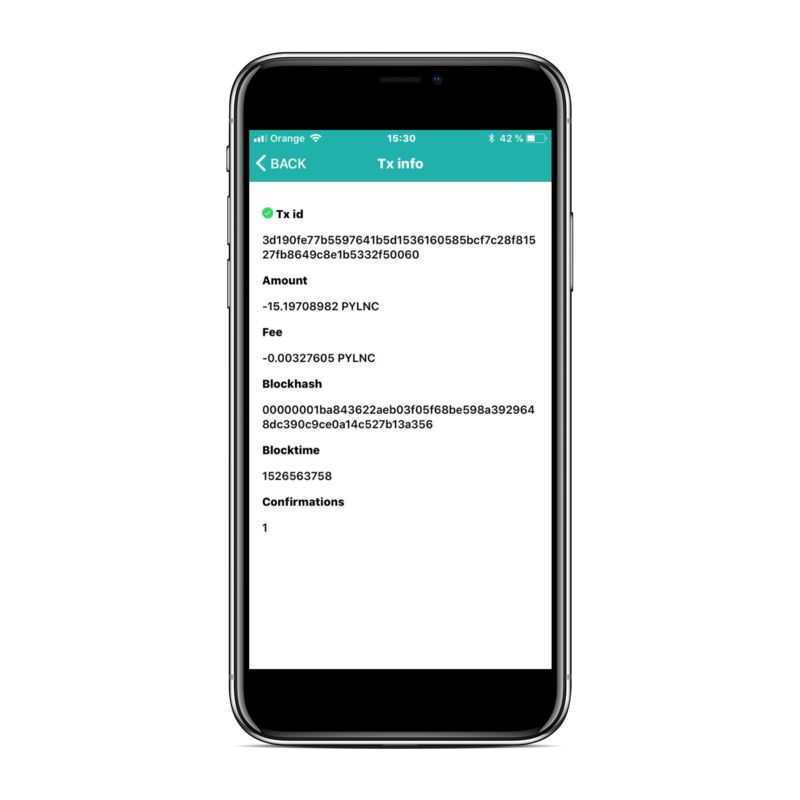 First version of METRON dApp is ready and free to download! 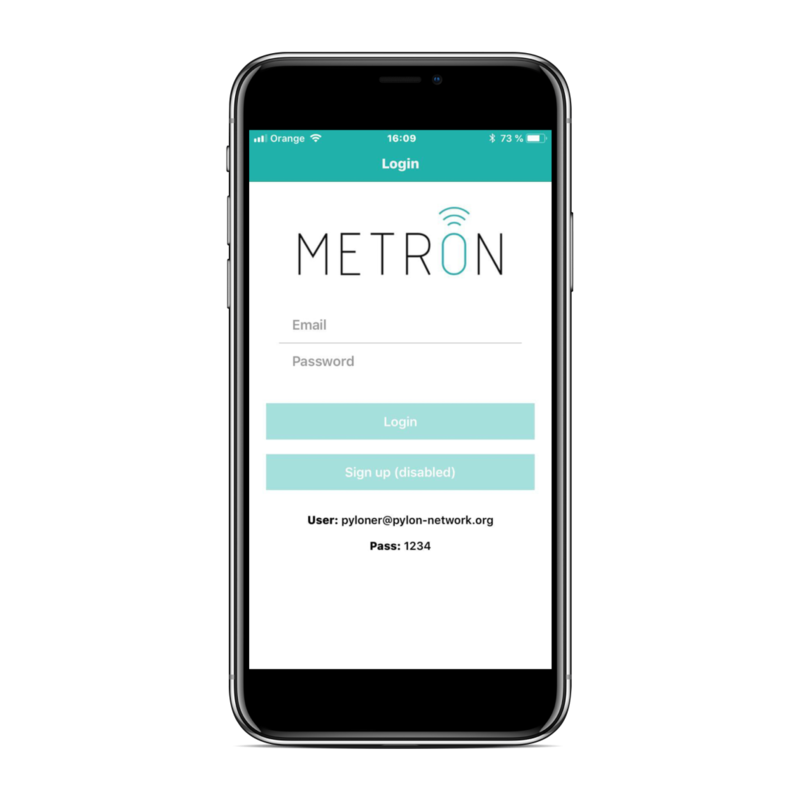 Today we are very excited to be announcing the release of our METRON distributed app (dApp) for Android and iOS devices! After months of development by our tireless dev team the first version of METRON dApp is ready and free for anyone to download. And we are very happy for that! Because on one hand, it signifies the completion of a milestone and on the other hand, because of its importance in relation to our core values and philosophy: bringing the technology to the final consumer helping him interact, understand and be included in the operation of a distributed, smart energy system. With that said, let’s dive into it! The next sections will take you through the operation of METRON dApp, its capabilities related to the DEMO stage of Pylon Network and the future improvements that our dev team is already working on! Stay in control! – Visualize their hourly electricity consumption of their home. Trust the system! – Certified electricity data and payments, recorded on Pylon’s blockchain. However, this is not only for METRON owners. The release of the dApp is also addressed to our amazing community (you!) who are willing to test it, stress it and play with it – and then provide us with feedback on how to make it better, more useful or anything else your creative mind would like to see on the dApp. We appreciate and value all perspectives, so please don’t lose any time. 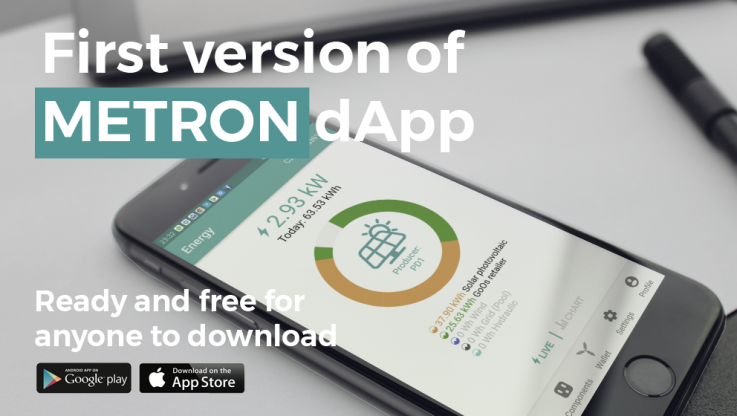 The METRON dApp is available for Android and iOS devices – download for free on Google Play or AppStore. Since this is the version 0.2.3 , no registration is required. Once the dApp is downloaded and launched for the first time, the intro page (shown in image below) appears: use the username and password at the bottom of the page, to log in. Once you have successfully logged in, you will access the first tab of METRON dApp where you are able to see the consumption, production and origin of the energy exchanged between the users connected to the Pylon Network demonstration, as well as the payments made between them. In the upper right corner of the “Energy” tab (which by default, it opens on the “live mode”) you can choose one of all the users participating in the simulation. Open the drop-down list by pressing on the arrow. While on “live mode” the consumers are able to know the origin of their consumed energy, in real-time (shown at the center of the pie – “Producer PD1”), but also know the energy mix of their energy consumption, since last midnight. Looking at the screenshot below, the pie chart indicates that, until that point of the day that the electricity consumption was 63.53 kWh, the consumer has purchased almost half of his/her electricity directly from PV producers participating in Pylon Network and the rest half, from the electricity pool, backed up with Guarantees of Origin (GoO) – also known as Renewable Energy Certificates (RECs). The remaining (grey) part of the chart corresponds to the future consumption until next midnight (it will be filled completed within the following hours). By going on the “Chart mode“, the user can switch to a graphical representation, which focuses on their consumption profile. As shown in the screenshot below, a graph of the user’s consumption appears, showing not only their hourly energy consumption on graph, but also the maximum instantaneous power (i.e. peaks) duringh each hour. By clicking on the dropdown menu – located above the left side of the graph – you can look at different periods to be shown on the graph (for now the available options, essentially limit the maximum period to 48h – today, yesterday and the last 24 hours). Of course, weekly, monthly, annual periods will be included in the future. A convenient tip to know for the “Chart mode” is that by orienting your smartphone horizontally, the graph will adjust to the full-screen, allowing you to look closer and in more detail the data on the graph. Besides the Energy consumption tab for all consumers, there are four more tabs: Components, Wallet, Settings and Profile. The Components tab (currently under development), will allow users to add smart components and take control of their home consumption without the hastle. 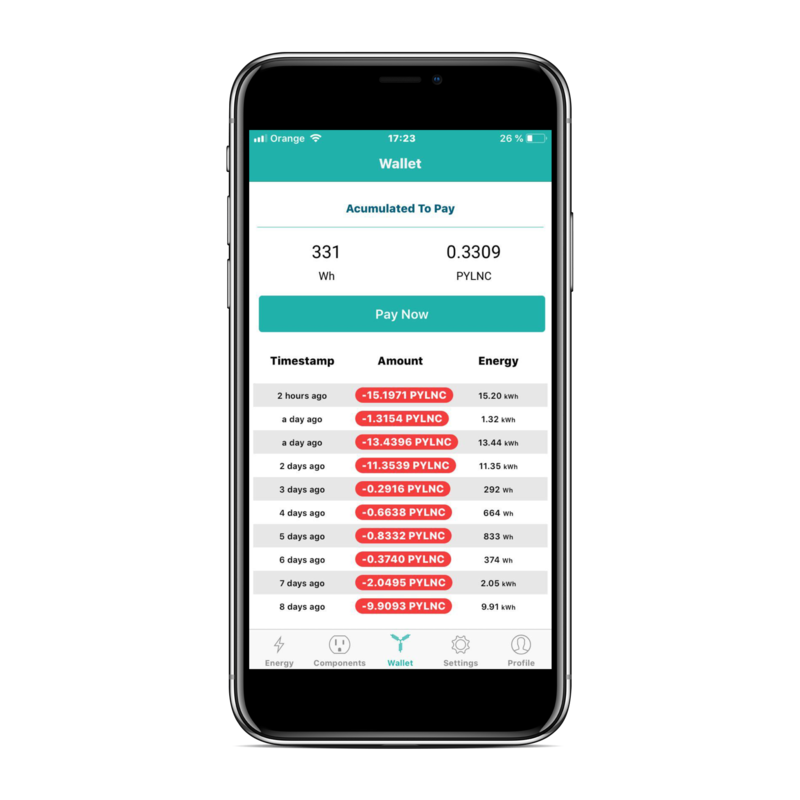 Through the Wallet tab, the user can perform digital payments for the consumed electricity and have access to a history of their payments and blockchain confirmations. You can either make an instant payment (by tapping on Pay Now) or let the code do it automatically once a day. 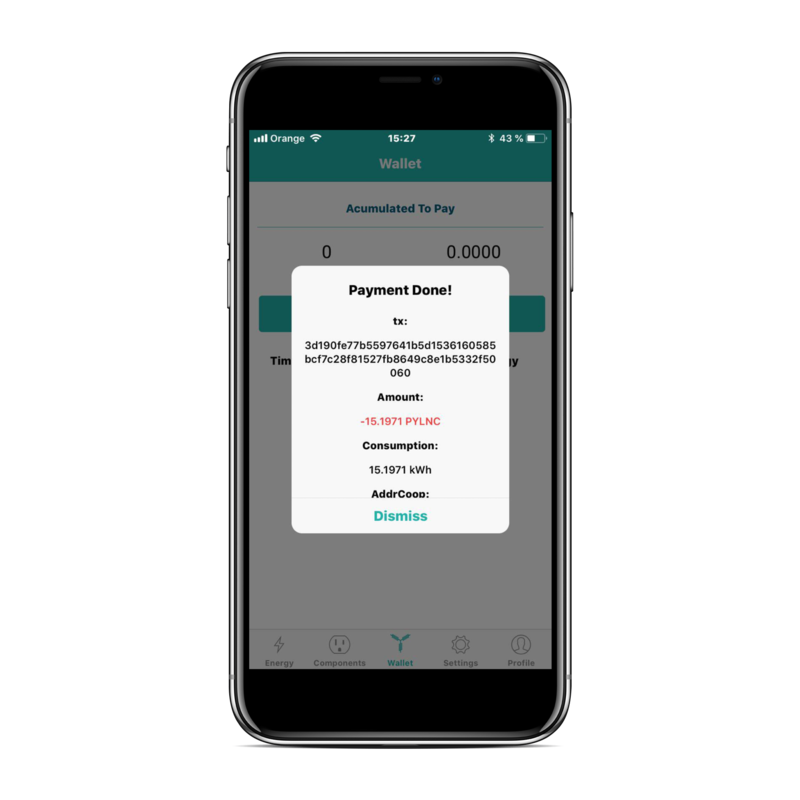 If you click on any of the past payments from the list at the bottom of the page, you are shown the details of the payment-energy transaction. (Images below). Finally, the remaining two tabs (Settings and Profile) offer some additional information about the current version, as well as the hardware installation. The development of METRON dApp will follow the development of our web DEMO (https://pylon-network.org/#demo) as it evolves through the demonstration stage. Automated billing and energy efficiency tips (for pilot participants). Automated reports of energy consumption (understanding your energy habits). Integration of PPAs – Power Purchase Agreements – for direct sale of electricity from RE producers to GoiEner’s consumers. So, now that you are fully prepared, it’s time to give it a try yourself! Just download the app and explore it; and after that tell us what you think. Your feedback is something we really appreciate, so please, feel free do so through the GooglePlay/AppStore reviews system or by contacting us directly through any of our channels (see below). We rely on you to make this technology as accessible, simple and useful for our energy systems. PYLON NETWORK.The revolution will not be centralized. 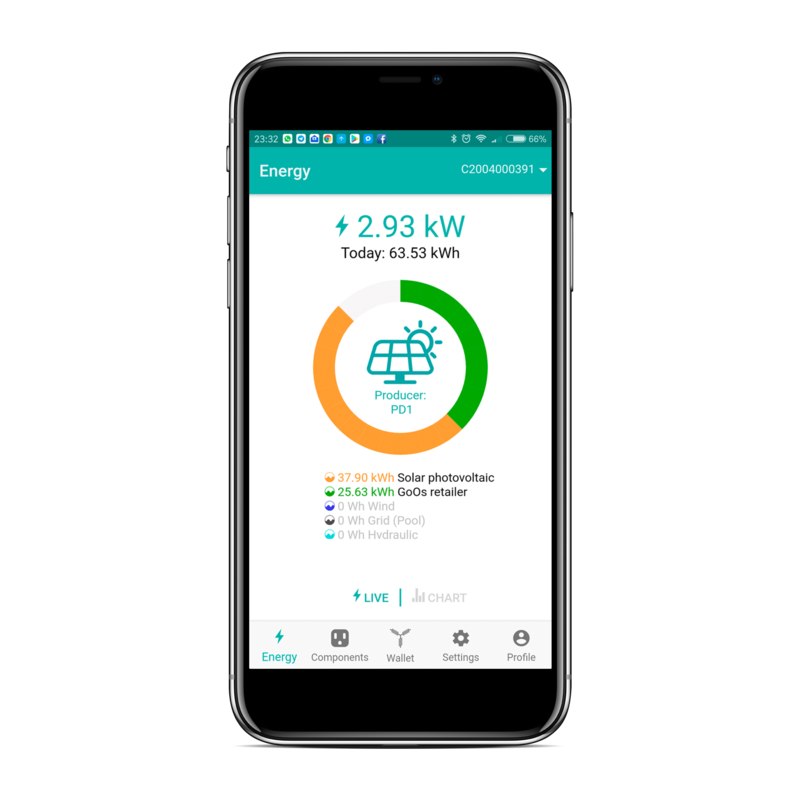 Pylon Network and eGEO close a collaboration agreement for the development of a certified energy meter. PYLNT to be listed on QIEX exchange!